The Village Community School is a 300 student K-8 private school in Greenwich Village that occupies a former parochial school, built in 1878 in the Victorian Gothic style. By the late 1990’s, the school had outgrown this facility and determined to expand on an adjacent corner site by building new classrooms, a gymnasium, a multi-purpose auditorium, and an outdoor play space. Programming involved interviews with all constituencies of the VCS community. The new building is designed to match the old in height, width, and materials (patterned red brick) and to fit comfortably into the neighborhood. 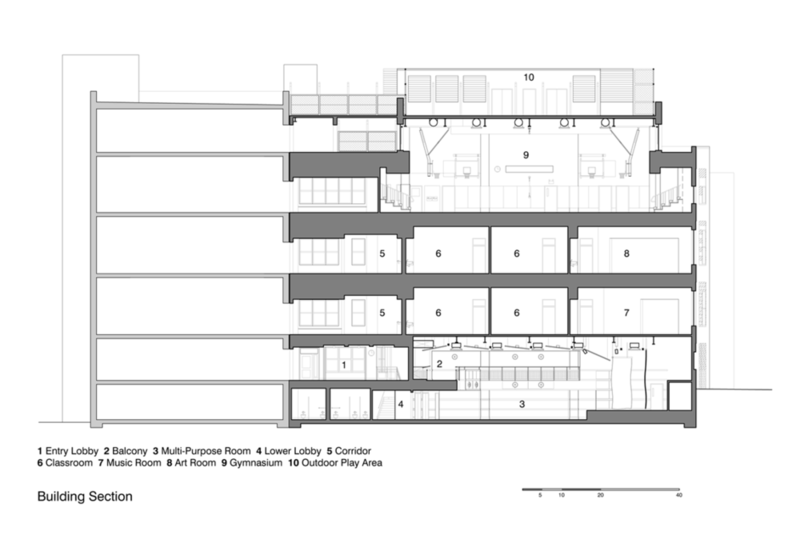 Floor plates align with the adjoining building, providing unusually generous ceiling heights and window openings. Interior spaces are warm, intimate, colorful, and flexible. Village Community School has long made teaching hand-tool skills to their youngest students a part of the curriculum. This classroom occupied a former two-car garage at one end of the play yard, separate from the school building. While oddly charming, this concrete block studio lacked basic amenities. Heat, plumbing and electricity were haphazard. After their addition was completed, the School decided to upgrade the woodshop. 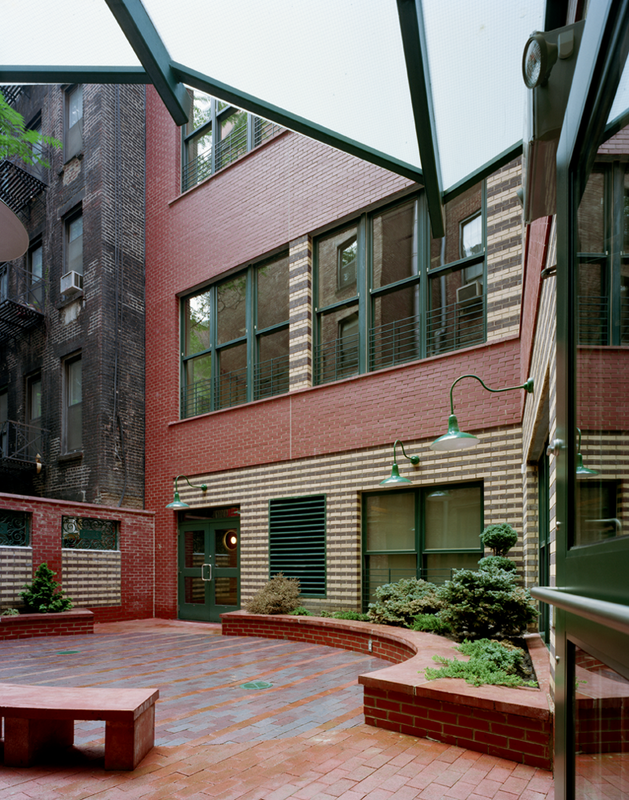 The project preserves the landmarked street façade, but entirely rebuilt the structure (and systems) behind it. Patterned brick infill of garage bays recalls the exterior of the main building. The new interior is flooded with daylight, full of storage, and organized efficiently. The construction of a Multi-Purpose Room in our addition to the Village Community School allowed the existing auditorium to be transformed. It became a full service commercial kitchen and cafeteria, capable of serving 300 students and 75 faculty & staff daily. The new kitchen occupies the previous stage area (with the serving line recalling the proscenium), while organizing the cafeteria circulation and seating arrangement to allow seamless flow for lunch service. Two pairs of exterior double glazed doors were added to increase natural light and provide direct access to the main play yard. The original cast iron columns and maple floors were preserved, stripped, and refinished, while new perforated acoustic tin recreates the original ceiling and reduces noise during meals.